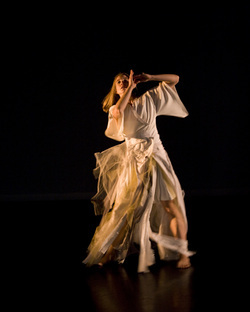 Kaidan (premiered September 2010, Philadelphia Live Arts Festival) is inspired by characters from traditional japanese ghost stories. Utilizing dance, video projection, kinetic sculpture, and costume design, Kaidan is a 30 minute performance choreographed for the stage. Kaidan Insuto, presented by thefidget space in October 2010, is an interactive performance installation in the vein of a haunted house. Inhabited by the same characters found in Kaidan, Kaidan Insuto is an environment the audience enters into (those who choose to becoming a part of the performance). "From concept to design to performance to experience, the work is brilliant, perceptive, craftfully (and craftily) expressive and fully and immersively engaging... more superlatives ... more superlatives ... "
"...nothing less than a fresh, and powerful, realization of the intimate presence and intertwining of the seemingly-impossibly-wonderful with the completely everyday things that are handled and taken for granted each day." Parlyaree, with a projected premier date in 2013, is an interactive performance installation inspired by carnivals with their freakshows, traffic patterns, lights, sounds, and smells.